more journal articles on using paper clay here. Where There's Smoke...Paperclay in the Anagama - a new technology in an old setting. My current work utilises. a strange mixture of technologies. I use an ancient firing method, a simple tunnel kiln or anagama, because of the resulting surface textures and glazes. 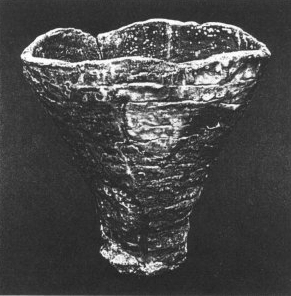 Unfortunately, firing larger scale work in the anagama is awkward and costly in terms of pots lost. A comparatively newer technology - paperclay - offers me a solution to these cracking and loading problems, which occur in the harsh environment of long wood firing. Since 1988 1 have been firing an anagama once or twice a year. Anagama kilns are simple, single chambered tunnel kilns. The front of the chamber is the firebox, and the tunnel slopes gently uphill to a flue that ends in a chimney. Anagamas are not sophisticated kilns, in fact they are inefficient and labour intensive. The appeal of the anagama is the palette of textures and colours possible with this firing procedure. Each part of the kiln gives distinct patinas and markings that provide unique textural surfaces for ceramic pieces. An understanding of the flame path and control of the ember bed enable the firer to manipulate fire marks and natural ash glazes distinctive to this firing method. In using an anagama to fire my work I accept the constraints of the firing process by making pieces specifically for each area of my kiln. In choosing the decorative palette produced by anagama firing, pieces need to withstand the stresses of long wood firing. Suitable clays are needed for each area of the kiln. Even using appropriate clays, I found cracking occurring as the height of pieces increased. Handbuilt pieces up to 90 cm developed small cracks during the firing due to the large temperature variation from the top of these pieces to the bottom. These pieces were very crisp with smooth surfaces, which were spoilt by these cracks. In May 1995 I attended Sculpt-Up-Gulgong and saw paperclay being used in the wood kilns. Intrigued, I made up some paperclay and mended some of my cracked pots - even building a new base for one. With the leftovers I made some small pots for further testing. This new material appeared to complement the anagama firing of larger pieces of work. Testing showed paperclay is sufficiently robust for this particular firing process that exposes pots to the fury of the flame and ember over several days. Paperclay, very simply, is a mixture of paper pulp and a clay slip. 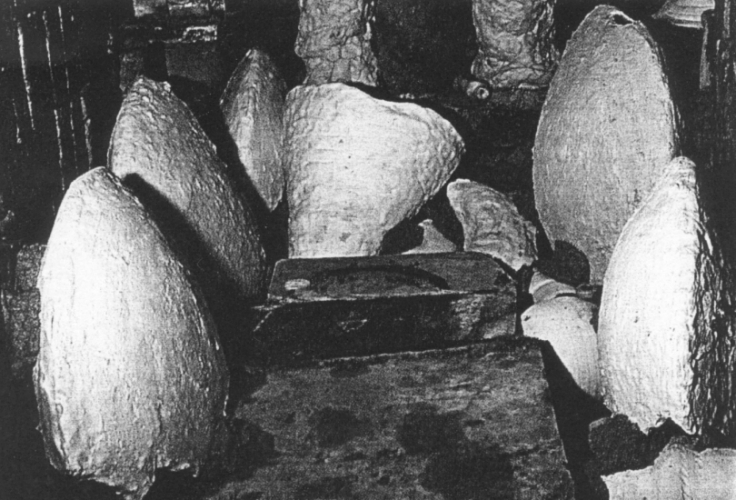 The paper pulp contains cellulose fibres that give paperclay its unique physical properties. These long flexible tubes absorb water readily, enabling paperclay to be wet and rewet many times without drying cracks forming. The cellulose tubes also act as a web intertwining the much small clay particles. This is the reason for paperclay's green strength and resilience to stresses during making and firing. Paperclay has major advantages for my work practice. Apart from the elimination of cracks, paperclay allows an increase in the scale of work. The ease of working with larger pieces is increased due to the lightness of the material and the green strength when bone dry. This allows easy moving of the pieces into kilns and around the studio. Packing the anagama is a two day job and placement of pots is vital for flame markings, for achieving temperature and for determining how much ash strays onto the pots. With paperclay pots being strong and light the physical aspects of kiln packing are a lot easier. Most of any work is tumble stacked (stacked without shelves) for fire marks and paperclay widens the possibilities of packing arrangements. The strong green strength allows easy transportation of raw pots to the anagama, eliminating the to bisque fire the work. Paperclay is particularly useful in the firebox area of the anagama. The firebox is an area of intense combustion. Pots are exposed to intense work heat and the possibility of being hit as the kiln is stoked. This area of the kiln is very harsh on pots. I pack my firebox with pots of all sizes as this is the zone that gives beautiful purples, yellows and greens. These colours are accompanied by granular textures similar to corals. Depending on the firing cycle these granular glazes can be covered with layers of luscious green celadon- like glazes. Results are vivid, and strongly patterned. Work is made for this area of the kiln with an understanding of the possible surface textures and colours that may occur. This illustrates the constraints of working with anagarna firing. My clay practice operates within a framework determined by the choice of firing but encompasses the 'unknown' that is central in long wood firing. I like to place large pieces under the stoking ports. Paperclay is very suitable for this area of the kiln, where I keep the temperature lower to obtain matt natural ash glazes. Surfaces are quieter, enhancing larger forms without dominating them. Side stoking cycles enable me to build up landscapes on the surfaces of pieces in this area. Because pots are partially buried this can accentuate the temperature difference from the top to the bottom of a piece. Paperclay helps eliminate stress cracks that can occur because of this temperature difference during long firings. For flame management in this part of the kiln it is important not to have large spaces at the top of the pack. With my larger paperclay pieces, both handling and the control of voids for the flame path, is made much easier. Paperclay offers scale and packing possibilities using the anagama that are not viable for clay. For these reasons paperclay has been an ideal material for use in an old firing process. The use of paperclay does have its drawbacks. In the raw state the paper component rots and becomes rather offensive. Making paperclay is time consuming and requires space and organisation. During the early stages of firing horrible smells emanate from the kiln - not nice for the neighbours. All of these problems can be overcome but it does emphasise the need to have a good reason to incorporate paperclay into your studio practice. In my present work I have the intriguing situation of using a new material in an ancient firing process. My current work is mostly handbuilt, allowing the construction processes to be visible. In accepting that the anagama process determines what is possible in terms of texture, colour and form, I have tried to simplify 'the making process' in creating pieces that have an immediacy enhanced by the firing. These undulating surfaces are accentuated in the anagama firing, subtly or dramatically, depending on placement in the kiln. Paperclay provides a making freedom both in construction methods and size of work. Possible. It has been a slow process to even begin to understand the decorative potential of the anagama but I think that applies to whatever area of ceramic technology we decide to work in. I am still analysing the results of each firing, trying different packing ideas and have the occasional kiln disaster. Despite the frustrations I am still excited, Stimulated and drawn to the exotic, evocative surfaces obtained by anagama firing. Paperclay amphora-fired in a rear of kiln. 26 x 26 x 53cm. Paperclay 'split' from floor of firebox-natural ash glaze. 33 x 26 x 32 cm. Paperclay pots in firebox of anagama - during firing these pots are covered in embers. 9 x 9 x 16 cm. Paperclay vase from floor of firebox-natural ash glaze after 100 hour firing. 9 x 9 x 16 cm. This article originally appeared in Barbara Campbell-Allen (1997) Pottery in Australia, , (36), 1, 16-18. Reproduced with permission of the author (email June 2001).